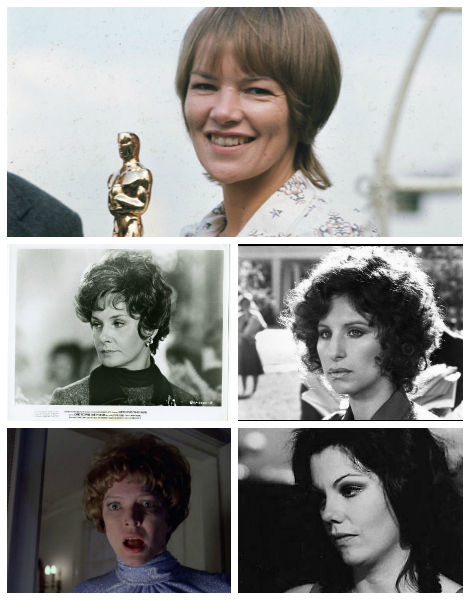 Posted on 31 January 2013 31 January 2013 by PaulaPosted in FeaturesTagged 1970s, 31 Days of Oscar, al pacino, barbara streisand, blogathon, ellen burstyn, glenda jackson, jack lemmon, jack nicholson, joanne woodward, marlon brando, marsha mason, robert redford. I’ve never seen Summer Wishes, but it’s on my list now, as it Save the Tiger. It was interesting to see that some of these are still well-known (The Sting, The Way We Were, Serpico) and some not (Summer Wishes, Cries and Whispers). Do you think Redford split his own votes? 1970s cinema! Lots of different films to choose from and some truly great performances and tough decisions to be taken. In a year when the women gave as well as, and sometimes better than the men. It looks like your Oscar Blog-A-Thon is off to a great start! Thanks for starting the discussion with such a lovely, insightful comment. Joanne Woodward is an under rated actress who has delivered more than was asked or required. Very perceptive and hard to reel in, because she is so darn good. While Jack Lemmon made his mark throughout his career and is just now being noticed for his tremendous and varied talents. against the less talented Ms. Streisand. I love this! 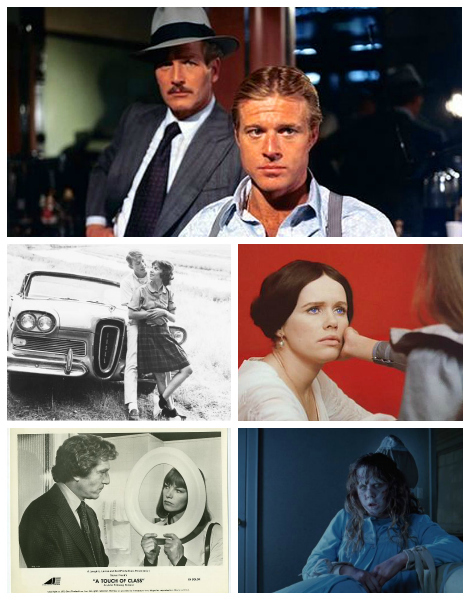 What a terrific look at movies in 1973….and a great list of movies for me to see. I’ve only seen 3 of these, but I really want to see the rest. I’m on a bit of a Lemmon and Redford kick these past few months, so I’m especially interested in those. Terrific post and beautiful blog! The 1970s was the last great hurrah for Hollywood. Before blockbusters took over and its actors and actresses became homogenized, bland and safe. Lemmon and Redford are great places to start. Michael, (leopard13) over at “It Rains… You Get Wet” just finished a great review of Redford in ‘The Hot Rock’ that is definitely worth the trip! If the film I’ve highlighted piqued your interest. I’ve done my job well and truly. Thanks very much for your kind words and compliment! The 1970s were the last great hurrah for Hollywood. And if my words piqued your interest. I’ve dome my job well! I haven’t seen Summer Wishes yet either but I will. I never have sat down and looked at the year that is 1973 before with such detail. So many wonderful films that have only become better with time. Thanks for a great write up and for a fun blogathon. My comfort zone is older, B&W and Noir films. And 1973 has some seriously heavy contenders in the Oscar race. Old versus new in actors, directors and on down the line. Thanks very much for the link and the re-blog! OK. A stellar year, as you note throughout. Standouts are mentions of my love, Jack Lemmon whose performance in Save the Tiger you describe to a Tee. I’ve only to add that he had in fact proven the depth to which his acting prowess went well before 1973 but that no one recognized it because he was so adept at comedy as well. Like you, I can’t argue with the Best Picture win for The Sting but if choosing today it would be The Exorcist – a film with such power that doesn’t diminish with time or viewings. It also lingers far beyond what any piece of entertainment should. The 1970s are my second favorite decade in film – after the 1940s. The depth of talent mentioned in this post covering one year’s time is a clue as to why. Thanks so much for your delightful, insightful comments! The Oscar selections for 1973 show how quickly and how much films and their directors and producers were willing to go to get their ideas and final products out into the open market. Very diverse, yet well executed and delivered. Which opened the door for a lot of talent. The 70’s- what fascinating decade in film- such a departure and juncture of change. When you examine this list of cinema from 1973, as you did so well here, what strikes me is the true diversity of choices. I have not seen a few of these so definitely appreciate the heads-up. Thanks for being a part of this blogathon, Jack Deth! Making 1973 a surprisingly entertaining eye of a coming storm. Awesome post, Jack, 1973 is a very good year indeed, which reminds me I NEED to see The Sting soon! Fascinating look back on one of the great movie years of the ’70s. Exciting stuff seemed to just flow from that decade – I suppose “Bonnie & Clyde” kick-started the change in 1967, at least it seemed suddenly movies began to become more daring/experimental/irreverent/creative then. I remember seeing almost every one of the films you mention when in release. And I remember becoming very uncomfortable while watching “Last Tango” with a young man I didn’t know very well. Very interesting film. It holds up better for me than I expected it to. Thanks so much for the splendid comments. Great piece, Kevin! Sorry it me awhile to get here, but better late than never ;-). I totally agree that 1973 was an extraordinary year in as your say, “… the last great era for films.” A singular decade for film, which you captured its context well in your retrospective. We both love ‘The Exorcist’ and ‘The Sting’, we just differ on who was on top that year ;-). I was one who totally agreed about ‘Saving the Tiger’ and Jack Lemmons brilliant portrayal within. He earned that Oscar. It was indeed ‘A Very Good Year in Film’. Well done, my friend. If you have the chance. Check Netflix or other venues for IFC’s (Independent Film Company) superb documentary, ‘A Decade Under the Influence’ directed by Ted Demme. For a retrospective by the actors and directors of that time. Oooooh, that sounds like a great doc, Kevin. Thanks for the heads up.